Some expats and foreign buyers often consider buying property around Christmas time. 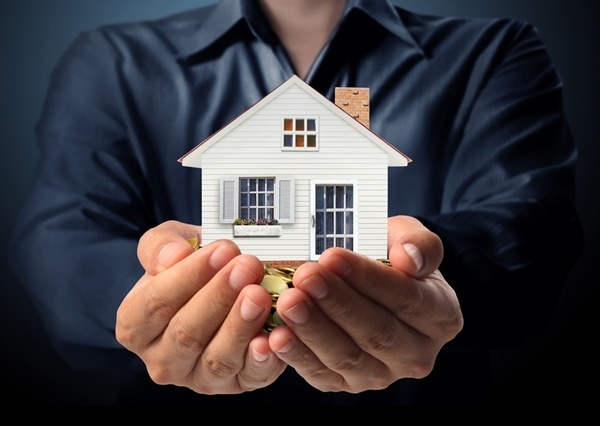 With the Aussie dollar significantly down around USD 73 cents from its parity level a few short years ago it makes property investment and home buyer a lot more attractive. Confidence in the Australian economy, and therefore the Australian Dollar, sky-rocketed when Glenn Stevens, the Governor of the Reserve Bank of Australia, removed much of the likelihood for an interest rate cut in the Australian economy in the early part of last week. And today we have seen that rates remain on hold. The significant level of 2.10 was breached comfortably and GBP/AUD rates careered down to 2.08, but the correction re-established 2.09 by close of play on Friday. After 5 months of steady decline the Euro fought back currently sitting just below 1.47. Whereas the US Dollar amid rumours of the impending rate hike climbed back to above 1.37. The attractiveness of the AUD currently lies in that Interest rates are much higher than other major currencies, for example Sterling is at 0.5% while AUD enjoys a return four-times higher at 2.0%. A cut had been expected following the dramatic events over in China during August, and many were worried the Australian economy would suffer with the reduction in demand for its goods overseas. However, the Australian economy has weathered the storm surprisingly well. Proving it to be largely resilient to lowered demand in China. Significant recoveries in the employment and trade sectors in October, which nullified the necessity of a cut to protect the Australian economy and spurred the continuing strength of the Aussie Dollar. 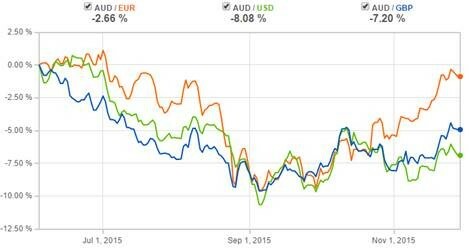 As you can see from the graph below showing the % change in rates over the last 6 months against the 3 majors overall the AUD is down meaning it is still a great time to buy Australian. However from early September you can see a clear reversal in the trend as the Aussie is regaining much of its losses. While a rate cut in the future is not off the table it’s unlikely in the next few months because the Australia consistently enjoys a boost from the tourist industry during their summer months between November and March. The influx of foreign spenders will provide further support for the economy, stopping the necessity of financial intervention in the economy, and allowing further gains for the Australian Dollar. Inflation figures will be released 30/11 and are set to easily outshine that of the UK and Europe for the fourth month in a row and with the expected rate cut which kept rates above 2.10 removed, and it would not be a stretch to say the current rates on offer could be the best available for the rest of the year and into the first few months of 2016 as the Aussie continues to strengthen. So for those looking to purchase property in Australia now would be a prudent time to lock in a rate of exchange before a strong Australian Dollar pushes prices higher and higher! Our alliance partner deVere Foreign Exchange is able to offer our subscribers a free Foreign Exchange account which not only gives clients access to rates up to 5% better than the banks and a dedicated client manager to look after you requirements and monitor the markets on your behalf but rates can be fixed for up to 12months if you do not require your AUD until a later date, avoiding gambling on what rate may be available by the time it comes to your purchase. If you are seeking a safe and secure method of international funds transfer please email us today for an introduction to Joel Symmons at deVere Foreign Exchange to maximise your transfer value.